Welcome to our website. This is designed purely to provide information to those considering a holiday in our home as well as providing some practical information to those already enjoying the house and village. There already exists a very comprehensive package about the general area which you can find on www.isleoflewisholidaycottages.com however this site is designed to offer more information about the house itself. If you can't find the information you require here, please contact me using the contact sheet provided on the contacts page. I should normally be able to reply within minutes. If you would like to enquire about the availability of Taigh bhe, please just click on the availability link which will take you to the calendar which I keep regularly updated. My family have lived on this site for many, many years and I have recently been fortunate enough to have taken ownership of the house. When the family can't be there, I am more than happy to welcome those looking to enjoy this beautiful corner, an ideal base from which to explore the island. 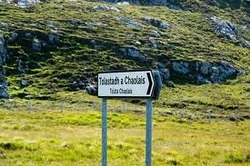 The word "Bhe" (pronounced Vey) is the old family nickname and Taigh Bhe simply translates as the house of the "Bhe's"
The village name Tolastadh A Chaolais is, like most in the area, Scandinavian and translates as "Tol's steadings by the straights".